Trying to make a decision between using a recruiting agency vs. RPO can be a difficult choice, especially if you’re not super clear about the differences. Within the recruiting industry, the water can sometimes get a bit muddy and there are a lot of misconceptions about the differences between the two. The short answer is that recruiting agencies and recruitment process outsourcing are very different animals in the way they go about finding talent and in their service offerings, as well as how (and what) they charge for their services. It’s a question that we received in a recent webinar, so we thought we’d discuss the differences in more detail. The primary role of a recruiting agency is to make placements, and they make those placements from candidates that they have sourced themselves. Agencies get paid when they sell you one of their candidates. As a result, recruiting agencies actively discourage their clients from using employee referral programs (the proven best source for new hires) and the client’s company website to find talent on their own. They don’t want to lose their fee. On the other hand, RPOs encourage sourcing from ALL resources to find great talent. They source candidates on their own, through employee referral programs, and the company career site to help you find the BEST FIT candidate for your open positions. That means that an RPO is not only managing the recruiting function to find top talent from any available resource, but they are also helping you to build your employer brand. Because recruiting agencies are getting paid for each placement they make, they want to “own” each candidate that they present to their clients… Forever. That means that you can’t go back at a later date and offer a position to a candidate that was previously presented to you by a recruiting agency unless you want to pay them for that placement – even if your contract with the agency is complete. RPOs think that is completely crazy. RPOs don’t believe that they “own” candidates. You own your own candidates, whether the RPO sourced them directly or they came into your pipeline through a company website or employee referral. Your candidates are yours. Recruiting agencies make placements – and they only make placements. They “sell” their candidate’s capabilities and leverage a placement guarantee to help close the deal. It’s a “fill the job quick so we can get paid” mentality. In general, recruiting agencies don’t make hiring manager satisfaction, your employer brand, or candidate care a priority. On top of that, agencies often leave some recruiting tasks in the hands of the client’s internal team, including writing job descriptions. That means clients are paying a premium for candidates and still doing a lot of the work themselves. When you work with recruitment process outsourcing, it’s a completely different story. Recruitment process outsourcing manages the entire recruiting function. While different RPO companies have varying ideas about what that looks like, a true RPO takes care of the people, process, technology, and strategy of recruiting. That means doing everything from writing job descriptions and candidate screening to improving hiring manager satisfaction and employee branding. RPOs view their relationships with clients as a long-term, strategic partnership with built-in accountability to ensure a consistent talent pipeline. 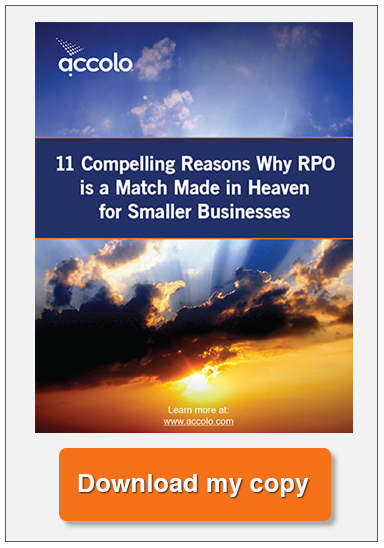 Another one of the really big differences between agencies and RPO is how they bill clients for their service. Agencies charge 20% to 30% of the salary of each placement they make. In other words, if the agency is tasked with making a placement for a position with a $100,000 salary, then the agency would charge between $20,000 and $30,000 to make that placement. That means it would cost the client $120,000 to $130,000 to make a placement for that $100k position – plus your internal team is still doing a lot of the work. Recruitment process outsourcing approaches the same situation very differently. 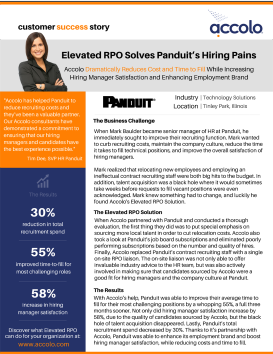 RPOs typically charge a monthly management fee to manage the entire hiring function along with some transactional fees to fill individual positions. When all is said and done, the total cost of an RPO ends up totally 60% to 75% less than what agencies charge, plus you get the added advantage of freeing up the internal team to accomplish other tasks. There are really huge differences between recruiting agencies vs. RPO. In fact, they represent completely diverse approaches to hiring. Understanding these fundamental differences will allow you to make a good decision about your needs and which type of firm best fits your organization.